BOSTON (APRIL 24, 2018) — Jumpstart is pleased to announce a new partnership with global learning company Houghton Mifflin Harcourt’s Books for Young Readers division to celebrate the power of reading with young children through Jumpstart’s 13th annual Read for the Record campaign. Read for the Record is a national effort to raise awareness about the need for high-quality early learning for all children and the transformative power of books and reading to impact student learning and engagement. 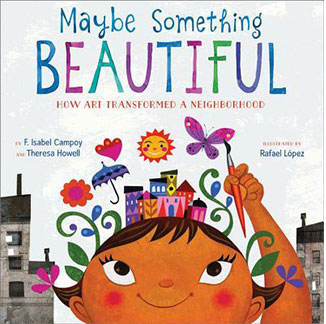 Published by Houghton Mifflin Harcourt Books for Young Readers, this year’s book selection, Maybe Something Beautiful, by F. Isabel Campoy and‎ Theresa Howell, and illustrated by Rafael López, celebrates the magic that can happen when a community comes together to create something beautiful and bring about change – a fitting metaphor for a campaign that features thousands of events in communities across the country each year. Home to award-winning adult and children’s literature, HMH is also a leading K-12 provider, building learning solutions that impact millions of teachers and students daily. The Read for the Record campaign culminates on October 25, 2018, when adults will come together to celebrate Read for the Record Day by reading Maybe Something Beautiful to young children in their communities and being part of an attempt to beat the world record for most people reading the same book at the same time. Since 2006, this 24-hour celebration has mobilized over 19 million people in support of early education and literacy, including celebrity ambassadors such as Josh Duhamel, Bridget Moynahan, LL Cool J, Maya Angelou, Mandy Moore, Julianna Margulies, and more. A limited number of special-edition copies of Maybe Something Beautiful will be sold exclusively by Jumpstart. Special editions will be available in paperback in both English and Spanish and will feature reading tips, vocabulary words, reading comprehension questions, and activity guides developed by Jumpstart’s team of early education experts. All proceeds help bring Jumpstart’s program to preschool children in under-resourced communities across the country. Jumpstart is a national early education organization working toward the day every child in America enters kindergarten prepared to succeed. By participating in Jumpstart’s yearlong program, children develop the language, literacy, and social and emotional skills they need to be ready for school, setting them on a path for lifelong success. Since 1993, Jumpstart has trained 45,000 college students and community volunteers to transform the lives of over 100,000 preschool children nationwide. Jumpstart is a proud member of the AmeriCorps service network. Learn more at jstart.org and follow us on Facebook and Twitter at @Jumpstartkids. For nearly two centuries, HMH Trade Publishing has published some of the world’s most renowned novels, nonfiction, children’s books, and reference works. As part of a leading global learning company, it is uniquely positioned to offer educational and entertaining content for all audiences. Its distinguished author list includes ten Nobel Prize winners, forty-eight Pulitzer Prize winners, fifteen National Book Award winners, and more than one hundred Caldecott, Newbery, Printz, and Sibert Medal and Honor recipients. HMH publishes such distinguished authors as Philip Roth, Temple Grandin, Tim O’Brien, and Amos Oz, and a celebrated roster of children’s authors and illustrators including Kwame Alexander, Lois Lowry, and Chris Van Allsburg. HMH is also home to The Best American series®; The Whole30®, Weber Grill, Betty Crocker®, Better Homes and Gardens®, How to Cook Everything®, and other leading lifestyle properties; the Peterson Field Guides®; CliffsNotes™; books by J.R.R. Tolkien; and many iconic children’s books and characters, including Curious George®, The Little Prince, and The Polar Express. HMH Productions, its newly launched division, develops and produces media and licensed products related to brands such as Carmen Sandiego and Oregon Trail.